Make your outdoor living spaces safer this season with Nashville deck and patio lighting. 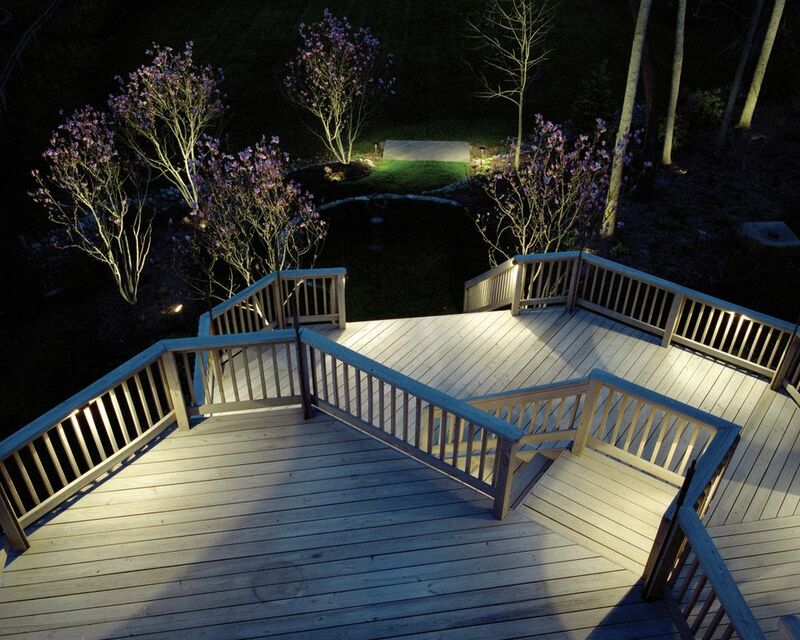 Deck lighting will enhance the safety and function of your deck. Deck and patio lighting brings your backyard to life after the sun goes down while improving outdoor safety. With May being the North American Deck and Railing Association’s Deck Safety Month, Outdoor Lighting Perspectives of Nashville would like to share with you ways lighting can increase the function, style and safety of your deck or other outdoor living space. Outdoor lighting, specifically deck and patio lighting, is especially helpful when installed by stairs risers, exits and handrails. 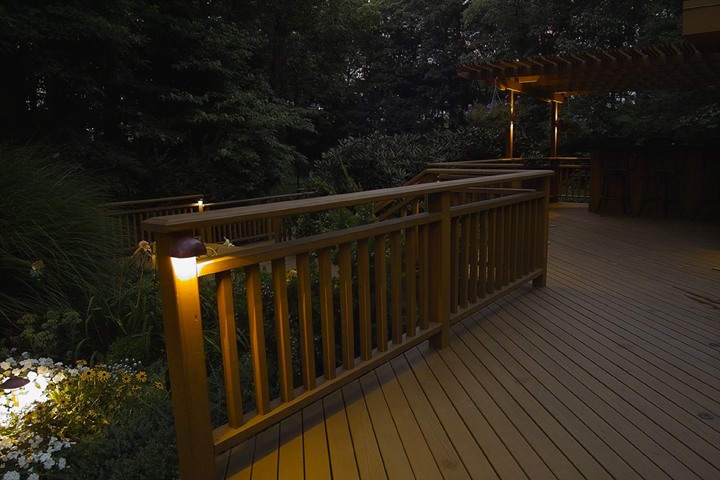 We also use deck lighting to create ambiance within areas that are being used in the evening. For example, pillar lights help define perimeters and look amazing when mounted directly onto brick and wood columns. Professional deck lighting creates a custom look for your outdoor living space with the dramatic play of light and shadows providing the right ambiance for your outdoor events and gatherings. This proper lighting is achieved by using a combination of lighting styles to accommodate different purposes. The size of the area to illuminate along with its function help to determine the types and number of lights you need for your deck lighting. Spot lights can be used in task areas, such as outdoor kitchens, while accent lighting creates a soft, inviting illumination in seating areas. Recessed lighting incorporated into steps and lights placed around walkways and doorways enhance safety. 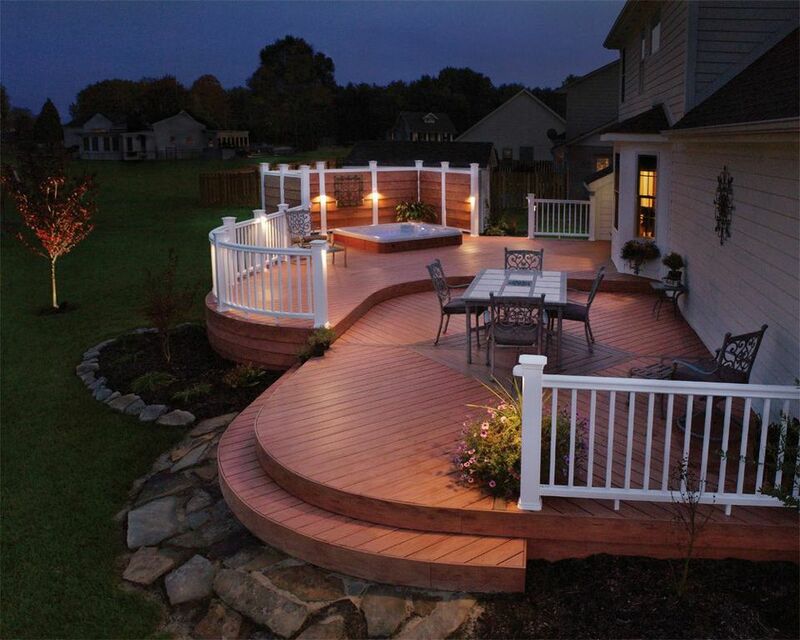 A well-lit deck makes your outdoor living experience safer. Increased visibility enhances safety and is attained with the right amount of light for the use of the space without distraction. Low-voltage lighting is best for deck lighting. It illuminates your custom deck without being overpowering or making it difficult to enjoy the night sky. This type of lighting will also prevent you from annoying your neighbors with intrusive exterior lighting. Outdoor Lighting Perspectives deck and patio lighting. When creating an outdoor lighting system, we focus on the effect, not the fixture. While the effect of our lighting design will increase the curb appeal of your home, our exclusive high quality fixtures add style and are a cut above the rest. Our corrosion-proof outdoor light fixtures, wires and lamps can weather the toughest outdoor conditions. You’ll love the way the solid copper and brass takes on a rich patina over time, blending beautifully into your landscape. With a long life expectancy and a consistent light output, we’re so confident of our equipment’s performance and durability that we offer unmatched warranty coverage. Adding outdoor lighting to your deck space will extend function and style while increasing safety when using your outdoor spaces in the evening. Memorial Day kicks off the summer season in just a few short weeks — have your outdoor spaces such as decks, patios, and pools ready for the occasion! With deck lighting sundown will no longer dictate the end of your outdoor living enjoyment! This entry was posted in Deck lighting, Focal point outdoor lighting, Landscape Lighting, Outdoor Lighting, Outdoor Lights Nashville, Outdoor Living in Nashville, Patio lighting and tagged Deck and Railing Association, Deck lighting for safety, Deck lighting will enhance the safety and function of your deck, Deck Safety Awareness month, Make your outdoor living spaces safer this season with Nashville deck and patio lighting, May is Deck Safety Awareness month, May is deck safety month, NADRA, NADRA consumer deck safety checklist, Nashville deck and patio lighting, Nashville deck lighting, Nashville deck lighting specialists, Nashville outdoor lighting safety Nashville safety lighting, North American Deck and Railing Association’s Deck Safety Month by outdoorlightingnashville. Bookmark the permalink.